Ko K’un-hua was born in the 18th year of Emperor Daoguang’s reign (Qing Dynasty) in 1838 in Anhui Province. During his teenage years, he became famous after passing the county examination to become a scholar. He became an aide to General Huang Kaibang and later served in the U.S. Consulate in Shanghai. Later, Ko K’un-hua became a secretary and Chinese teacher at the British Consulate in Ningbo for 17 years and in between this period, he served as a fifth grade officer also in Ningbo. 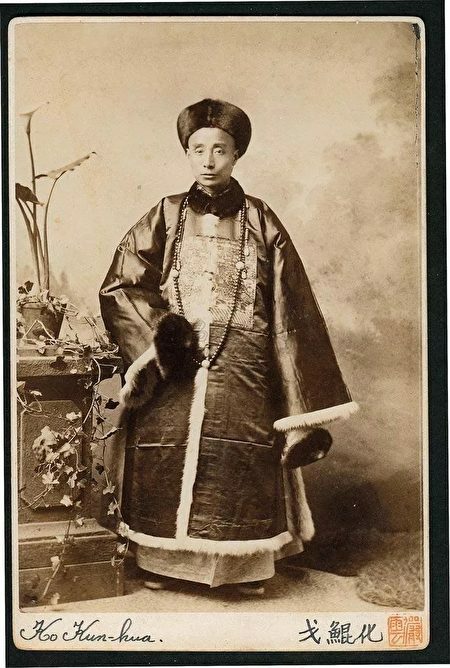 In February 1877, an American businessman, Francis Knight, proposed to Harvard University that they hire a Chinese teacher to teach Chinese language and culture to lay a cultural foundation for the political exchanges between America and China. In May 1879, Knight wrote to Harvard’s President Elliot saying: “I have identified a Chinese gentleman with an official title and very academically accomplished, who is willing to be a Chinese teacher in Harvard for three years. He is a writer and has worked as a translator for many years at the British Consulate in China.” Straight away, Harvard commissioned Knight to sign a contract with Ko for a term from September 1, 1879 to August 31, 1882. Ko was paid a monthly salary of US$200, double that of local American salaries at the time. Traveling expenses, including those of personnel who accompanied him, were borne by Harvard. In July 1879, Ko — along with his family, servant, and interpreter — boarded the British vessel Glenfinlas on a journey of more than 50 days sailing time from Shanghai to America. As soon as Ko arrived at Harvard, he tried to overcome his “dumb English” and quickly learned to speak English fluently. He translated his own poems. When it came to dealing with cultural differences between the East and West, Ko was clever and witty in handling the situations that arose. 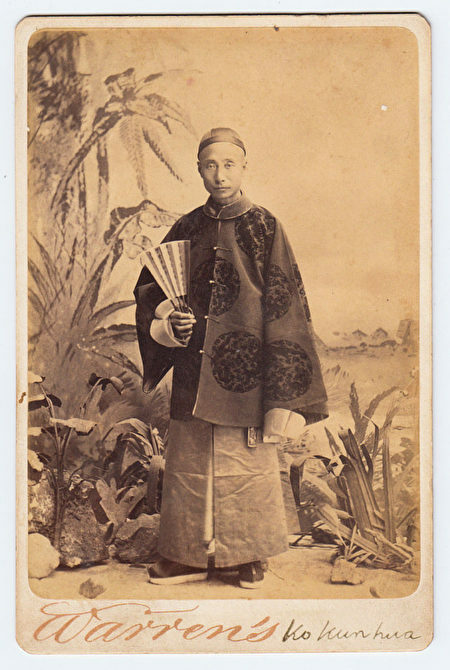 Ko insisted on wearing the long, high necked embroidered official robes of the Qing Dynasty official on the podium and wanted his students to respect their teachers. His students were not only confined to those from the school, but also included scholars who wanted to know about China as well as those engaged in business, diplomatic, customs, and missionary work. They could choose any of Ko’s courses as long as they paid school fees. Ko’s syllabuses were well prepared and also well received. The dignified Ko also wore the Qing Dynasty official attire for public occasions, such as lectures, receptions and parties. His robes and posture were highly relevant to the Chinese culture of the time. He always used fluent English to introduce himself, then recited his own verses or verses of the Tang and Song dynasties and finally bowed to thank the audience. Ko’s unique pragmatism and profound knowledge became actively integrated into American society and he personally promoted Chinese culture. 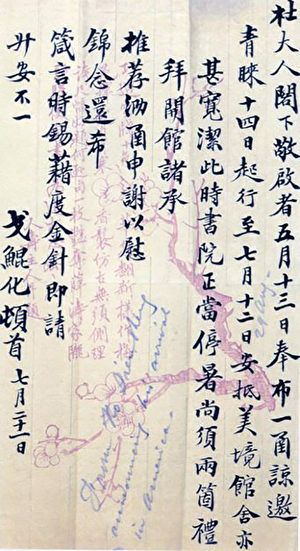 Ko specially compiled a Chinese book with 15 poems consisting of translations and annotations for the American society. This was the earliest textbook introducing Chinese poems written by a native from China presented in both Chinese and the English language. Sadly, on February 14, 1882, Ko died of pneumonia at the age of 48. Other media, such as the Boston Sunday Morning Paper and Daily Pictorial, published news of the death of Professor Ko, as well as memories and commemorative articles. On February 15, Harvard bid farewell to the pioneer who spread Chinese culture to America with a grand Western funeral ceremony. Eulogies remarked that: “Ko loved his life and was full of intellect and we can find similar qualities found in Confucius, the great saint of China”. After Ko’s death, Harvard University raised US$5,000 to care for Ko’s wife and children. In 1883, Ko’s son, Pengyun, studied at Harvard. Later, Pengyun became a famous Shanghai speaker and advocate of family education.